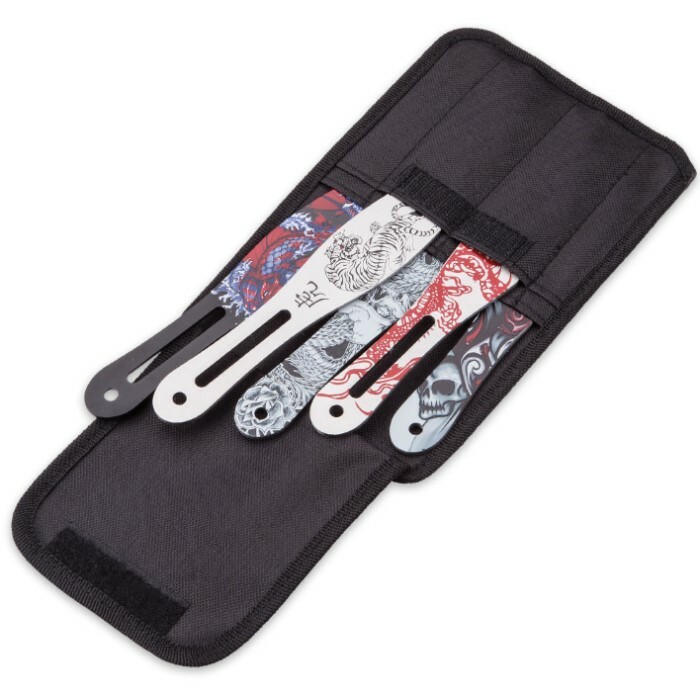 Overall length, each knife: 8"
Beautifully adorned with vibrant, eye-catching graphics, On Target's "AeroZen" 5-Piece Throwing Knife set is a veritable "savage menagerie" of mythical beasts and sacred animals. 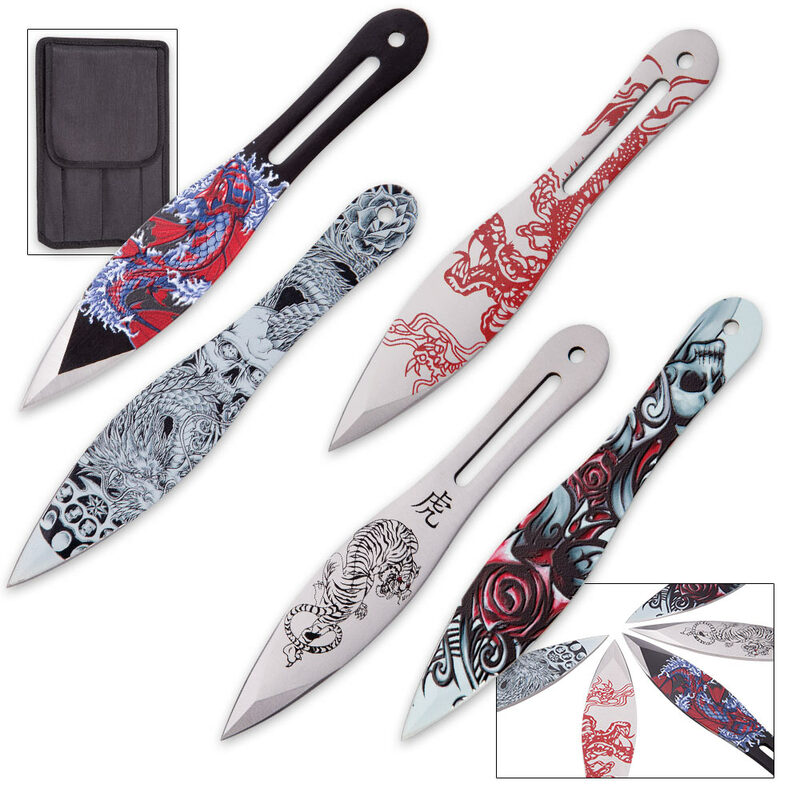 Each knife features its own unique artwork, ranging from a colorful depiction of koi to a macabre collage of roses and skulls. All of the imagery is precisely laser etched and won't fade or scratch even after years of punishing use in harsh environmental conditions. 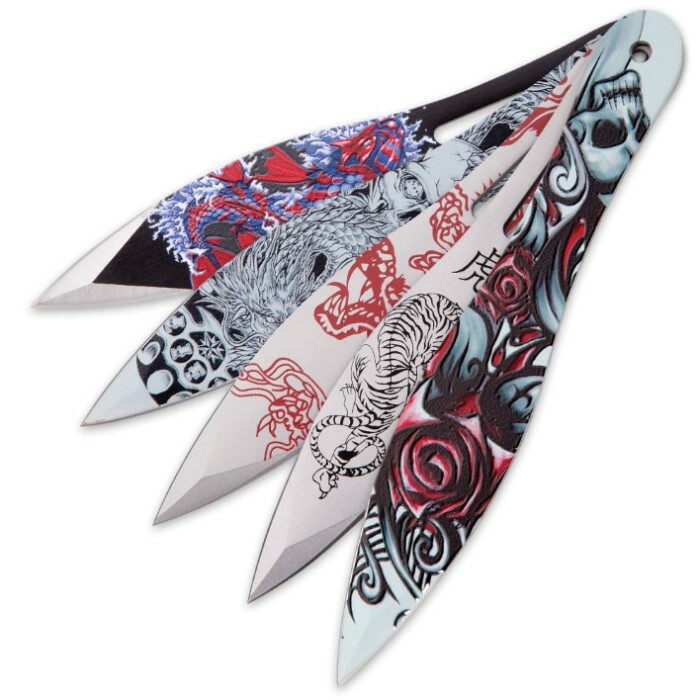 But make no mistake - these potent throwing knives are more than mere canvases. They're powerful, tough and battle-ready, boasting rock-solid one-piece stainless steel construction, razor sharp edges and bitter stinging points. 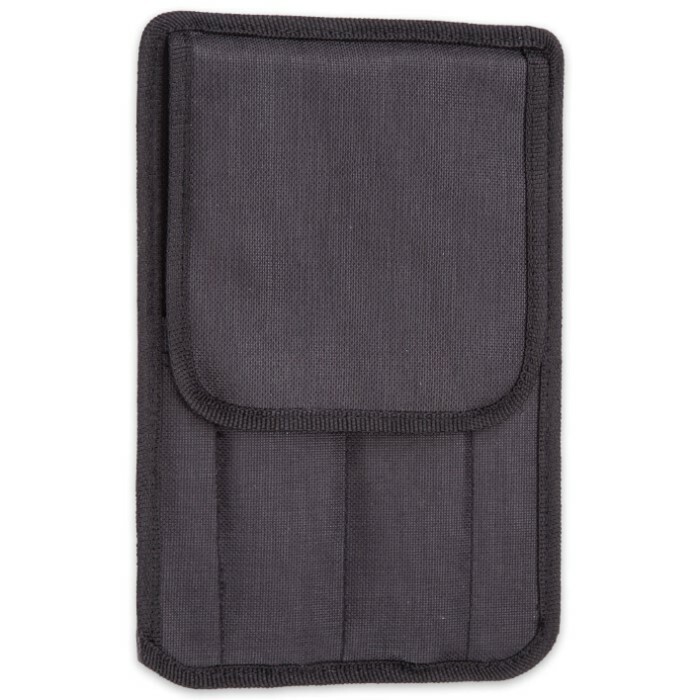 Impeccable weight distribution allows for brutal velocity and incredible accuracy, while convenient lanyard holes provide handy tethering and/or transport options. 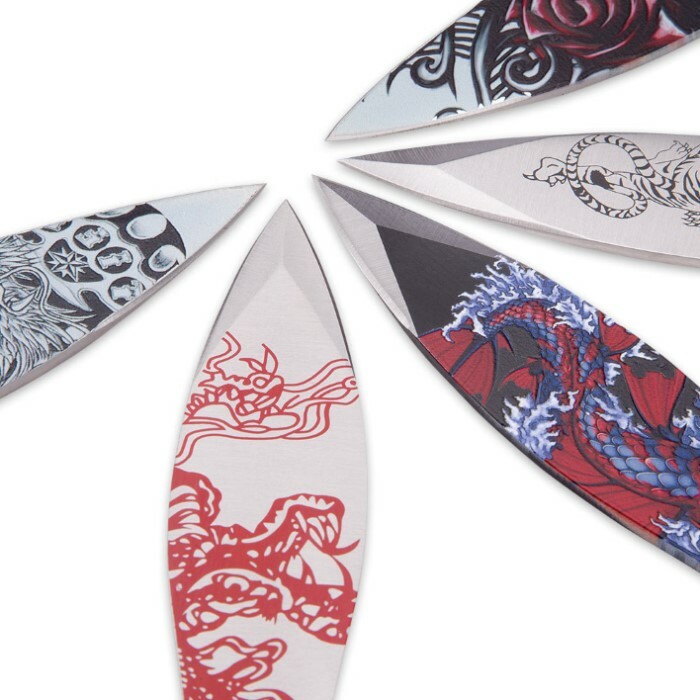 Whether you're neutralizing a far-off enemy or simply enjoying an afternoon of leisurely target practice, seeing an AeroZen throwing knife soar through the air is truly a thing of beauty. 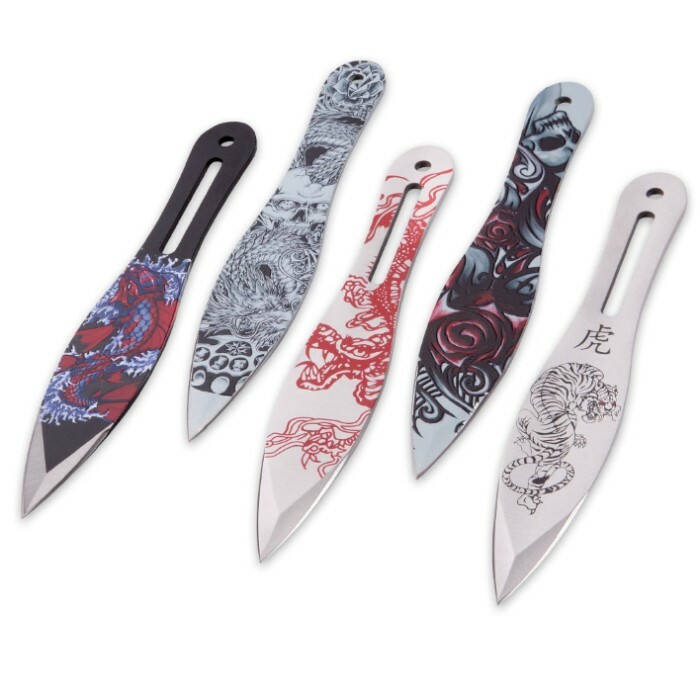 And unlike ordinary throwing knives, these radiantly decorated steel projectiles look amazing even when perfectly still, making them perfect for display - on their own or in a fine cutlery or Asian art collection.